What is Peripheral Vascular Bypass Surgery? How is Peripheral Artery Bypass Surgery done? Peripheral vascular bypass surgery is performed to restore blood flow (revascularization) in the veins and arteries of people who have peripheral arterial disease (PAD), a form of peripheral vascular disease (PVD). People with PAD develop widespread hardening and narrowing of the arteries (atherosclerosis) from the gradual build-up of plaque. In advanced PAD, plaque accumulations (atheromas) obstruct arteries in the lower abdomen, groin, and legs, blocking the flow of blood, oxygen, and nutrients to the lower extremities (legs and feet). Rerouting blood flow around the blockage is one way to restore circulation. It relieves symptoms in the legs and feet, and helps avoid serious consequences such as heart attack, stroke, limb amputation, or death. Blood pressure and pulses : pressure measurements are taken in the arms and legs. Pulses are measured in the arms, armpits, wrists, groin, ankles, and behind the knees to determine where blockages may exist, since no pulse is usually felt below a blockage. Doppler ultrasonography : direct measurement of blood flow and rates of flow, sometimes performed in conjunction with stress testing (tests that incorporate an exercise component). Angiography : an x ray procedure that provides clear images of the affected arteries before surgery is performed. Blood tests : routine tests such as cholesterol and glucose, as well as tests to help identify other causes of narrowed arteries, such as inflammation, thoracic outlet syndrome, high homocycteine levels, or arteritis. Spiral computed tomography (CT angiography) or magnetic resonance angiography (MRA) : less invasive forms of angiography. If not done earlier in the diagnostic process, ultrasonography or angiography procedures may be performed when the patient is admitted to the hospital. These tests help the physician evaluate the amount of plaque and exact location of the narrowing or obstruction. Any underlying medical condition, such as high blood pressure, heart disease, or diabetes is treated prior to bypass surgery to help obtain the best surgical result. Regular medications, such as blood pressure drugs or diuretics, may be discontinued in some patients. Routine pre-operative blood and urine tests are performed when the patient is admitted to the hospital. Surgery to bypass a blocked leg artery can relieve your symptoms. 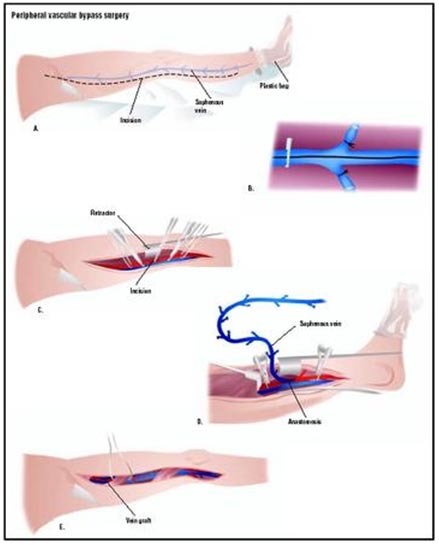 The bypass is done with a graft, a special tube that reroutes blood around a blockage. Blood vessel grafts often come from your own leg. They are removed and prepared at the time of the bypass. In some cases, a leg vein is left in place and connected to the artery (an in situ procedure). Manmade (synthetic) grafts are materials easily accepted by the body. 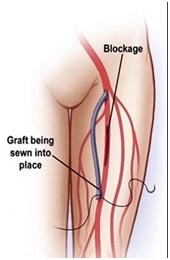 These grafts work best on arteries at or above the knee. During recuperation, the patient may be given pain medication if needed, and clot prevention (anticoagulant) medication. Any redness of the surgical site or other signs of infection will be treated with antibiotics. Patients are advised to reduce the risk factors for atherosclerosis in order to avoid repeat narrowing or blockage of the arteries. Repeat stenosis (restenosis) has been shown to occur frequently in people who do not make the necessary lifestyle modifications, such as changes in diet, exercise, and smoking cessation. The benefits of the bypass surgery may only be temporary if underlying disease, such as atherosclerosis, high blood pressure, or diabetes, is not also treated.